​1916. Leslie Edgar McMellen was born in Ionia, Ionia County, Michigan on 2 November 1916, the oldest of 2 children born to this union. 1930. US Census: Easton, Ionia, Michigan. Arthur Zemliska, head, owns home, has radio, lives on a farm, age 37, born in Michigan – father in Bohemia – mother in Michigan, works as a car shop mechanic. “United States Census, 1930,” database with images, FamilySearch(https://familysearch.org/ark:/61903/1:1:XQBS-X9X : accessed 8 August 2018), Leslie Mcmullen in household of Arthur Zemliska, Easton, Ionia, Michigan, United States; citing enumeration district (ED) ED 11, sheet 1A, line 26, family 7, NARA microfilm publication T626 (Washington D.C.: National Archives and Records Administration, 2002), roll 992; FHL microfilm 2,340,727. It may be that Leslie did time in the county jail. The following articles may not apply though the age is correct. More evidence is needed to verify the arrests and subsequent jail time. 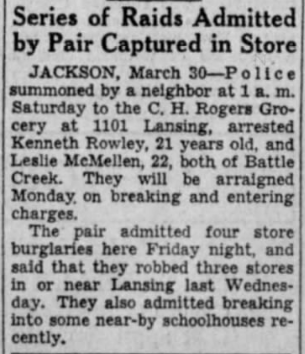 Was Leslie in Battle Creek in 1939/40? Articles state that he was of that place. 1940. Both Leslie and his partner in crime, Kenneth Rowley, are found as inmates in the County Jail on the 1940 US Census. 1943. Leslie (apparently went by Edgar) was married in Brighton, Livingston County, Michigan on 16 February 1943 to Margaret Mason [Source: Michigan, Marriage Records, 1867-1952]. “Michigan, Marriage Records, 1867-1952”, database, retrieved 8 August 2018 from Ancestry(http://www.ancestry.com): Edgar L. McMellen. 1943. 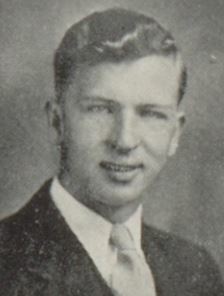 Leslie served in WW2. He enlisted 10 March 1943 and was discharged on 10 January 1946. U.S., Department of Veterans Affairs BIRLS Death File, 1850-2010 (database), retrieved 8 August 2018 from Ancestry(http://www.ancestry.com): Edgar McMellen. Michigan, Divorce Records, 1897-1952 (database), retrieved 8 August 2018 from Ancestry(http:www.ancestry.com): Leslie Edgar McMellen. 1979. Leslie died March 1979. “United States Social Security Death Index,” database, FamilySearch(https://familysearch.org/ark:/61903/1:1:J5TK-46K : 20 May 2014), Edgar Mcmellen, Mar 1979; citing U.S. Social Security Administration, Death Master File, database (Alexandria, Virginia: National Technical Information Service, ongoing).